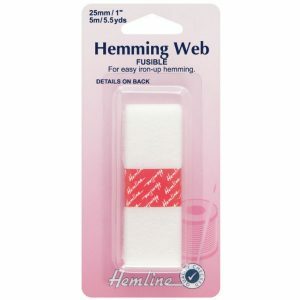 Fusible Hemming Web is an efficient, easy method to utilise in hemming or other Projects. Fusible Hemming Web 25mm x 5m. Use hemming web to fuse two fabrics together. For hems, facings, appliques, reinforcing, applying badges, patching etc. Fuse with a steam iron, pressing slowly and firmly. Hemming web is suitable for most fabrics, but always test on a sample prior to use. Fusible Hemming Web is an efficient, easy method to utilise in hemming or other Projects. 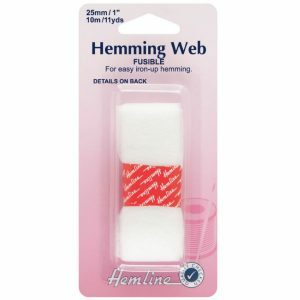 Fusible Hemming Web 25mm x 10m. Use hemming web to fuse two fabrics together. For hems, facings, appliques, reinforcing, applying badges, patching etc. Fuse with a steam iron, pressing slowly and firmly. Hemming web is suitable for most fabrics, but always test on a sample prior to use. 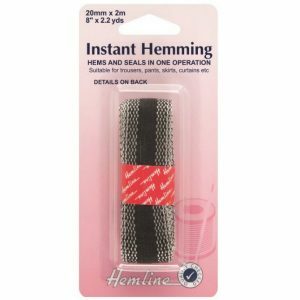 Instant Hemming 2m x 20mm. Hems & Seals in one operation. This modern hemming tape has glue threads woven into one side of the tape. Instant hemming covers the raw edge of the hem and seals the hem at the same time. When used on trousers this tape is very effective. Suited For Trousers, Pants, Skirts, Curtains Etc.